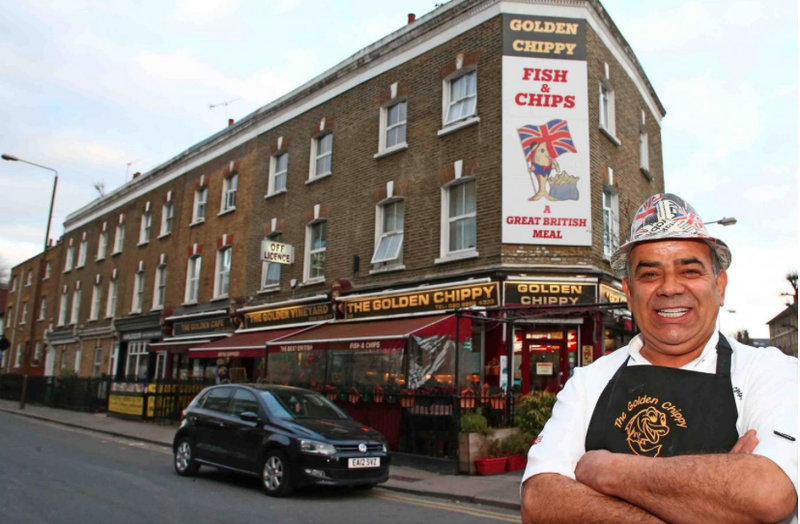 This afternoon Radio London's Drivetime program will feature the banning of the Golden Chippy sign - Valley Fontaine will interview Chris Kanizi at the Chippy at about 12 to 12.30pm. The interview will appear on Drivetime some time between 4 and 7pm - at the start of the show they give you some idea about when subjects will come up. Yesterday evening Radio London's Jason Rosam, interviewing the ATA's Mick Delap, said he thought it was amazing that Chris's petition to keep his sign had been supported by over 3,000 physically-written signatures - not just by buttons being pressed online. Mick told him that these signatures had addresses attached, and that 450 of them were by residents of the Ashburnham Triangle. If you want to listen-again to this interview, it was at 7.30pm yesterday on the Simon Lederman show. 'Chris Kanizi's application for retrospective approval for the Golden Chippy sign he installed some two years ago was rejected at Planning Committee on 13th March 2018. 'The ATA Core Group had been divided over the merits of the application, but had decided to support it because of concern about the reasons advanced by Planning for rejection, and because Chris Kanizi had been able to demonstrate that a good proportion of the Triangle's residents were on his side (of over 3,000 signatures to Chris's "save the sign" petition, some 450 are Triangle residents, and another 600 live in the Borough). 'The ATA submission to the Planning Meeting accepted that the sign aroused mixed feelings, but argued that on balance it matched the traditional culture and values of fish and chip shops, had an impeccable historic precedent (a previous 1940s sign of similar dimensions), and strong local support. As one of the guardians of the character and appearance of the Ashburnham Triangle Conservation Area, the ATA did not agree with Planning's Reason 1, that the sign damaged the visual amenity of the area sufficiently seriously to merit rejection, and harmed the setting of the listed Miller Hospital. As for Planning's Reason 2, judging that the sign's illuminations harmed the amenity of neighbouring properties, the ATA pointed out that for some time Chris Kanizi had removed all illumination from the sign, and had indicated his readiness to accept Planning Department's judgement about what if any illumination would be appropriate in the future. 'At the Planning Committee Meeting on 13th March, the responsible Planning Officer repeated the reasons for rejection. Robin Stott supported Chris Kanizi on behalf of the ATA, emphasising the removal of illumination from the sign, and the extent of ATA support. Of the three West Ward Councillors, Councillor Mehboob Khan spoke and voted as a member of Planning Committee in favour of the application. Councillor Maureen O'Mara, also a member of Planning Committee, recused herself from voting so that she could express her personal opposition to the application. Councillor Aidan Smith is a member of Planning Committee, but was not present. The Committee voted 3 to 2 to reject the application.